When students walk into your classroom, one of the first things that they want to know is where they should sit. Many teachers choose to take away the mystery by creating classroom seating arrangements. However, there are lots of advantages and disadvantages to consider. 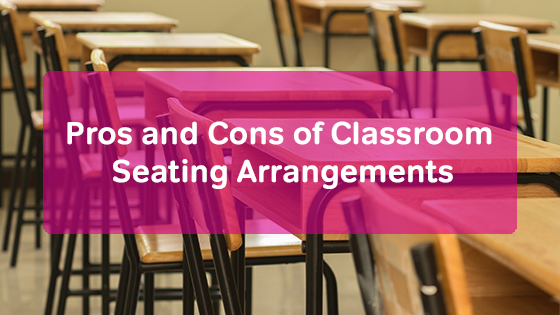 Think about the following pros and cons to determine if a seating chart is right for your class. Classroom seating arrangements are beneficial at the beginning of the school year since they can help you . Using your seating chart, you’ll know who is sitting where and recognize faces in the classroom faster. If your seating chart is arranged in alphabetical order, turning in papers for grading (especially if you hope to grade papers quickly) is a cinch. When all papers are in alphabetical order already, you can enter them into your computer in order. Making a seating chart may also prevent classroom management issues. You can separate students that tend to talk to one another. Move students who struggle to pay attention to the front of the class or near your desk, so you can keep an eye on them and encourage them to focus. By choosing who students sit next to, you can help them meet new people. Put students near people that can help them in class. You may also help create lasting friendships. At the beginning of the year, you don’t know which students are best friends or worst enemies. You could end up putting the wrong people near each other. Then, you’ll have more management issues than you would have otherwise. The lack of seating charts can be advantageous to students who are introverts. When sitting next to friends, they might be more likely to speak up and participate in class. Students need to take responsibility for their own education. By choosing their own seats, you encourage them to practice . They will have to focus on their studies even with their friends next to them. When you create a seating chart, some students will think that you’re picking favorites. It might create resentment and distrust. Since you want mutual respect in your classroom, this could be detrimental to the learning process. Weigh the pros and cons. Whether you decide to have classroom seating arrangements or not, you should set strict rules for your students. Have high expectations, and hold them to it!